The Education Building is where kindergarten through 5th graders attend an interactive service designed specifically for them. 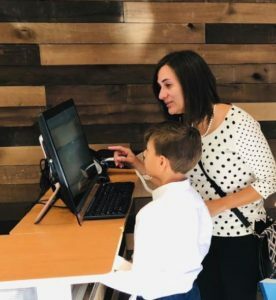 We are blessed to have dedicated teachers who are committed to reaching your children by providing them with Bible-based lessons that are truly anchored in the Word of God. 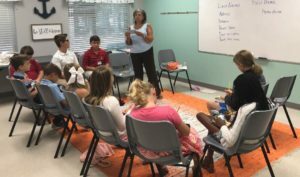 Each Sunday, kindergarten through 5th grade children begin in their Sunday School class where they spend 45 minutes learning about the Word of God through interactive and hands-on lessons. About half-way through the first adult Sunday Morning worship service, the children move to the “Big Room” where they dive into praise and worship, prayer, and the Word. Note: Anchor Kids Sunday school classes and Children’s Church services are provided only during the 9:15 am adult Sunday Morning worship service. Our desire is for children to grow in their knowledge and understanding of the Word of God and to develop a deep and lasting relationship with Jesus! How do I check my child into class? When you arrive at North Haven Church, come to the Education Building or ask the host at the Welcome Center to show you the covered walkway to the Education Building. Once in the foyer, visit the check-in station where you’ll enter the name and age of your child. A greeter at the check-in desk will tell you of your child’s room number and answer any questions you may have. You will be given two stickers; one goes on your child’s back and one you keep. You’ll show your sticker when you pick up your child after the service. Do you have security in place? Absolutely. The Education Building is a secure facility; meaning only authorized workers and parents/guardians with a sticker are permitted. For additional safety, we always have a trained security team member stationed in the building. Do you serve food and/or drinks? Typically we do not provide snacks. However, every 6-7 weeks we have a Remember and Celebrate lesson. We provide light snacks on those Sundays that coincide with the celebration. Please notify a leader of any allergy or diet concerns for your child. What is your policy for ill children? As a general rule, if children are ill or still recovering from an illness, they are not directed into the nursery/preschool area or into the Sunday School classrooms. If a child has a runny nose, fresh cold, fever, rash, persistent cough, diarrhea or any other symptoms of illness they would be classified as ill. We appreciate parent cooperation in keeping all of the children as healthy as possible and refraining from bringing children any of the above symptoms.